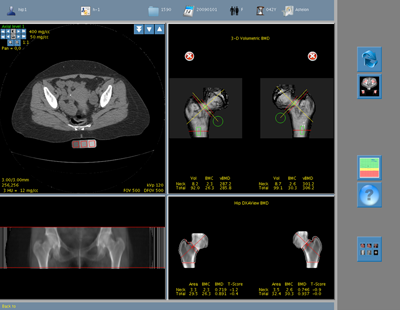 The N-VivoTM Hip BMD product is a new automated Application that utilizes CT 3-D volumetric images to provide Integral volumetric BMD and DXA like measurements of the hip. The CT images are calibrated using our calcium hydroxyapatite phantoms as with conventional QCT. Image processing methods for segmentations, calibration, coordinate system, rotations and ROI placements are all totally automatic. This is a first for bone densitometry. After segmenting the overlying soft tissue, the bone image data is re-projected from 3D to 2D space in the coordinate system. Similar ROIs and areal density results are produced as with conventional DXA. Physicians familiar with DXA can interpret our hip reports as they are accustomed and with similar diagnostic end points. WHO criteria for fracture risk are used and the patient results are compared to the NHANES reference data. Low bone density of the proximal femur is readily determined and can be compared to the clinical experience with DXA. N-VivoTM has again advanced QCT techniques by developing a small cross-sectional, longer calibration phantom. Whole body and hip scans can be carried out using the long phantom without re-positioning the patient or phantom. The small phantom cross-sectional area and tissue equivalence reduces artifacts and beam hardening while providing maximum comfort for the patient. The use of calcium hydroxyapatite and tissue equivalent calibration ensures your diagnostic results are equivalent to DXA devices, which also calibrate to calcium hydroxyapatite. No cross-referencing of the data is required. The hip CT scan requires minimal patient positioning concerns. Unlike DXA, which requires attention to leg rotation during the scan for reproducible results, rotation of the image data to the optimum view is performed by software after the scan is completed. Positioning errors are largely eliminated. Conventional DXA is known to create BMD inaccuracies in large patients with significant and/or inhomogeneous overlying soft tissue. The calibrated 3D data and imaging processing techniques of of our new product avoids these errors. 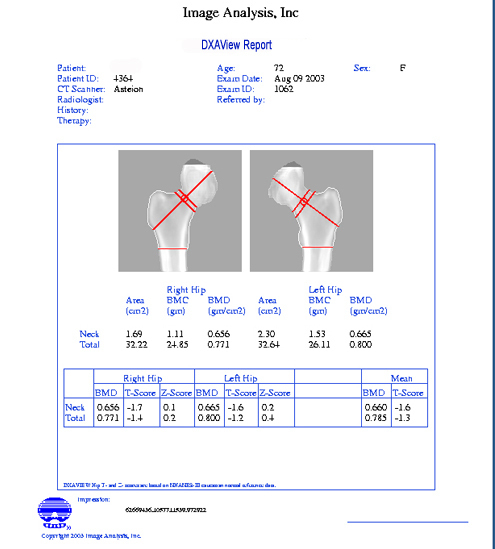 The DXAView Clinical report provides DXA equivalent 2-D bone densities of the neck and total proximal femur. The total hip and neck ROIs have become the most reliable regions for diagnosis and monitoring hip BMD. Mean T and Z-Score for these regions are reported for each hip and the totals.